Well, unfortunately I had to cancel this project. I can´t do everything by myself, I have many problems concerning to the modelling, textures, besides other things. So, until I have some free time and until someone offers to help me, the project is cancelled. Please attempt to finish it, I love knight rider, is it possible to let everyone know what parts you cant finish yourself because we people could be able to assist you in the completion. Hey mate, sadly i'm not working with modding anymore. Nevertheless here is all files you can see in the screen, you can make wherever you want with this ones. any no when its ready???? I lov it ! KITT ! I thiking to restart this project, for all knight riders fans, but again, i can't do everything by myself, i need help. So, anywone help me with the textures. 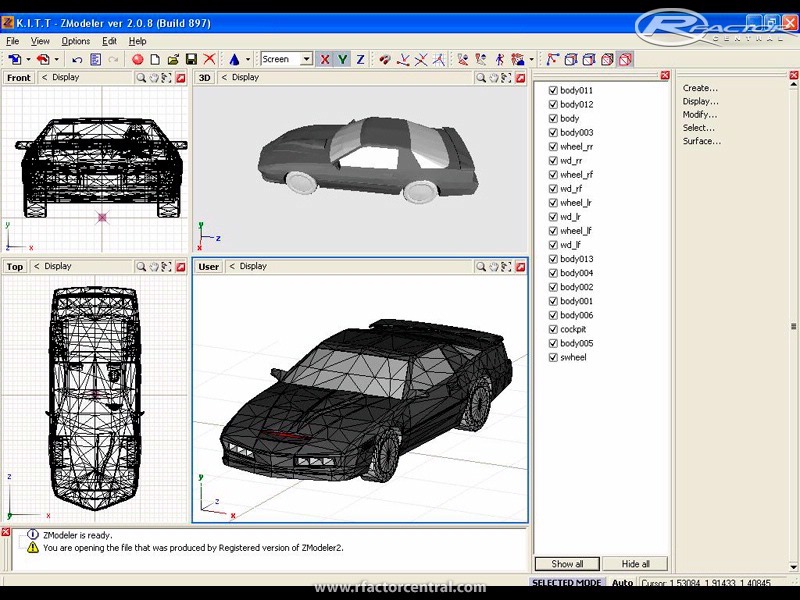 please can some1 give frguitar a hand to get this mod in rfactor i love kitt,if there is any1 reading this that can do it please consider giving some of ur time to get it in the game,who wouldnt want to drive kitt.